According to the Electrical Safety Foundation, faulty electrical wiring and arcing causes more than 73,000 home fires each year in the United States. The Arc Fault interrupter detects the frequency and “bounce” of the harmonics of the electrical wiring and if there is unbalance, will shut the power to the entire circuit off in about 1/10th of a second. This device can save your life and property. 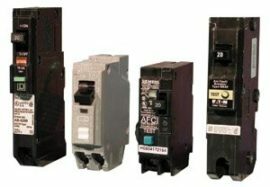 Call A.S. Electric for installation or for more information on the Arc Fault Interupters.